CONTACT SUE SYVERTSON TO REGISTER FOR WORKSHOP. To pay for workshop online CLICK HERE. Plein Air Painting in the United States is quickly becoming a favorite past time of professional and amateur artists alike. Mastering painting outdoors can be daunting. Suzie’s humorous and informative manner makes tackling this multifaceted challenge a fun and rewarding experience. Understanding the nature of light gives the artists and an extra measure of creative control over their painting. Suzie’s demo will kick off with a lecture about light and color and how different light sources; primary, secondary and reflected light, affect the scene so that you can understand and apply these theories to your next painting excursion. 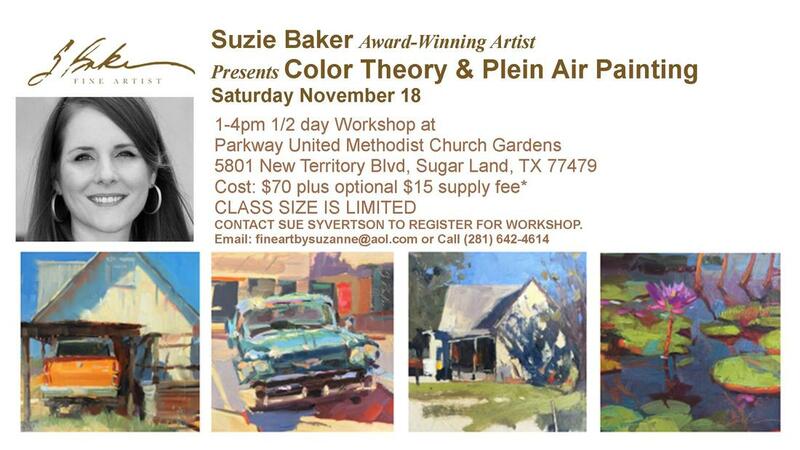 ​ Suzie Baker is an award-winning artist whose paintings have been featured in Fine Art Connoisseur, Plein Air, and Southwest Art Magazines. She has been named “Three to Watch” by both Southwest Art and Fine Art Connoisseur and will be a profiled artists in the upcoming December/January issue of Plein Air Magazine. She serves on the board of directors and is a signature member of Oil Painters of America and regularly exhibits in prestigious national shows and invitationals. This last summer Suzie painted in plein air events in Telluride Colorado, Easton Maryland and Door County Wisconsin producing over 40 paintings, selling roughly half of them and taking home First Place in the Telluride Plein Air Festival.